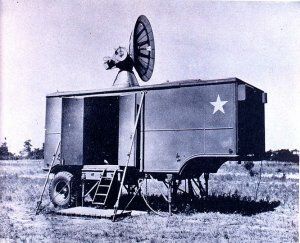 The SCR-584 was a mobile gunlaying radar known as the GL Mark 3A in British service. The finest fire control set of the Second World War, it was equipped with a PPI display for detection mode and automatically tracked a target once acquired. It was capable of tracking moving vehicles and even troops and remained in use until 1996. It was very effective against aircraft when combined with the M-9 director. Once locked onto an aircraft, it could automatically aim and fire a remote power-controlled gun, whose crew needed only to keep reloading. The SCR-584 could even locate artillery from the shell trajectories, and it was capable of directing ground support aircraft. Because the SCR-584 could track aircraft moving as fast as 600 mph (965 km/h), it was employed successfully against the V-1 "buzz bombs" launched by Germany in late 1944. Priority was given to the European theater, but units were operating in the Philippines by 1945. SCR-584 also became the basis for the SM-1 fighter direction radar used on Allied carriers in the Pacific.